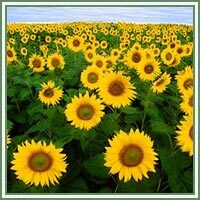 Habitat: Sunflower is native to the Americas, and was naturalized in Europe in XVI century. It prefers full sun and well-drained, neutral to slightly alkaline soils. 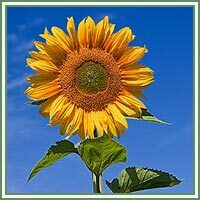 Description: Sunflower is an annual plant, growing up to 4.6 m tall. It has large, rough and hairy leaves, oval to cordate in shape. Flower heads are also large, growing about 20-30 cm in diameter. It consists of numerous, densely arranged florets. Sterile ray florets on the outer side vary in color- they can be yellow, red or orange. The disc florets inside the circular head produce seeds. The florets inside the circular head are called disc florets, which mature into seeds. The florets inside the sunflower's cluster are spirally arranged, which is a most efficient packing of seeds within the flower head. Medicinal use: Sunflower seeds are considered to have antioxidant, anti-inflammatory, diuretic and expectorant properties. They can help reducing the symptoms of asthma, osteoarthritis and rheumatoid arthritis and help in cases of bronchial, pulmonary and laryngeal problems. They can be applied as an addition to therapy of colon cancer, high blood pressure and migraine headaches. Due to their magnesium content, Sunflower seeds can also act as prevention against heart attacks and strokes. Sunflower leaves can be used as an infusion to treat high fevers, lung problems and diarrhea. As a poultice, Sunflower root is used against snake and spider bites.